How police use of force policies can help to end police violence. We reviewed the rules governing police use of force in America's largest city police departments to determine whether they include meaningful protections against police violence. We reviewed the use of force policies of America's 100 largest city police departments to determine whether they include meaningful protections against police violence. Click the boxes below to view details for each policy. 43 of the 100 police departments reviewed require officers to de-escalate situations, when possible, before using force. 84 of the 100 police departments reviewed have a Force Continuum or Matrix included in their use of force policy, defining the types of force/weapons that can be used to respond to specific types of resistance. 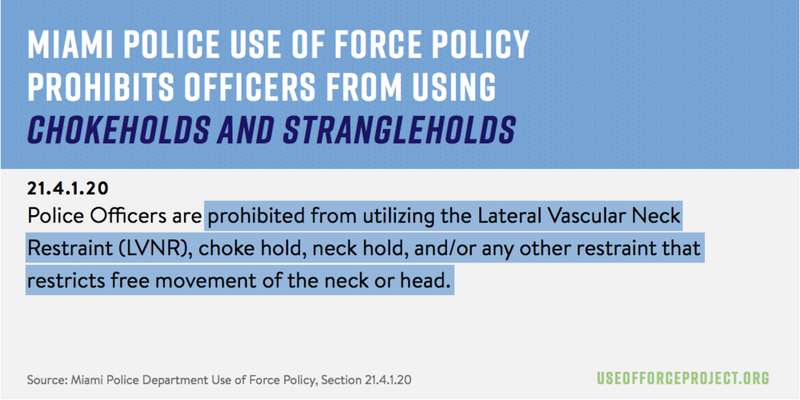 28 of the 100 police departments reviewed explicitly prohibit chokeholds and strangleholds (including carotid restraints) or limit these tactics to situations where deadly force is authorized. 67 of the 100 police departments reviewed require officer to give a verbal warning, when possible, before using deadly force. 16 of the 100 police departments reviewed prohibit officers from shooting at people in moving vehicles unless the person poses a deadly threat by means other than the vehicle (for example, shooting at people from the vehicle). 42 of the 100 police departments reviewed require officers to exhaust all other reasonable alternatives before resorting to using deadly force. 48 of the 100 police departments reviewed require officers to intervene to stop another officer from using excessive force. 25 of the 100 police departments reviewed require officers to report all uses of force including threatening another civilian with a firearm. We examined the relationship between use of force policies and police killings and found significantly fewer killings by police departments with strong policies in place. We compared police department use of force policies with police killings data for these police departments to see if there was a relationship between the two. We found that police departments with policies that place clear restrictions on when and how officers use force had significantly fewer killings than those that did not have these restrictions in place. For this analysis, we used police killings data from The Guardian's The Counted database, from January 1, 2015 - July 15, 2016. As shown by the chart below, there was wide variation in rates of police killings among America's largest city police departments. Then we examined the extent to which killings by these police departments were related to the number of restrictive use of force policies these departments had, as well as other factors including the number of arrests made by the department, size of the police force, racial demographics of each city, number of assaults on officers, and the median income and level of inequality in each city. For each of the 8 policies examined, police departments that had implemented the policy were less likely to kill people than police departments that had not. Police departments with four or more of these restrictive use of force policies had the fewest killings per population and per arrest. After taking into account other factors, each additional use of force policy was associated with a 15% reduction in killings by police. According to our analysis, the average police department would have 54% fewer killings and a police department with none of these policies currently in place would have 72% fewer killings by implementing all eight of these policies. These results indicate that while the chances of killing a civilian increases the more arrests a police department makes, that likelihood is shaped by the department’s policies governing how and when police can use force during those encounters. This suggests that advocacy efforts pushing police department to adopt more restrictive use of force policies - and the accountability structures to enforce them - can substantially reduce the number of people killed by police in America. And while this analysis was limited to examining rates of deadly force, these policies may also be associated with reductions in other forms of police violence as well. Despite their potential impact, efforts to push for these changes have often been opposed by police organizations that claim more restrictive use of force policies “endanger officers” or "put communities at risk" by preventing officers from effectively addressing crime (See here, here, here, and here). We find that these assumptions are not supported by the data. Officers in police departments with more restrictive policies in place are actually less likely to be killed in the line of duty, less likely to be assaulted, and have similar likelihood of sustaining an injury during an assault. Moreover, our findings show police departments with more restrictive use of force policies have similar crime rates, including similar violent crime rates, as police departments with less restrictive use of force policies. In short, a commitment to protect and preserve life necessitates the immediate adoption of more restrictive policies governing when and how officers use force in our communities. We have developed this model use of force policy based on our review and analysis of effective use of force policies across the nation. The policy includes evidence-informed restrictions on police use of force that are designed to significantly reduce police violence in communities. It should be adopted by police chiefs and local elected officials without delay.